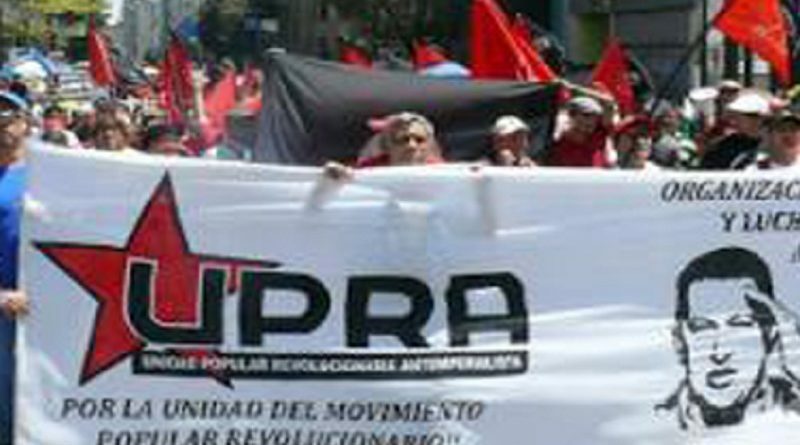 In behalf of the leadership and entire membership of the International League of Peoples’ Struggle (ILPS), I extend my warmest greetings of solidarity to the Unidad Popular Revolucionaria Antiimperialista (UPRA) on your national gathering of representatives of the organizations of workers, peasants and community activists with the aim of strengthening yourselves in the struggle against the attacks of the local reactionaries on the people’s rights and livelihood. I salute you for your strong commitment in the work of arousing, organizing and mobilizing the toiling masses in the defense of their democratic rights and against the attacks of local reactionaries who are in cahoots with US imperialism to maintain their privileges and roll back whatever progressive socio-economic reforms the Chavez and Maduro governments have put in place for the benefit of the people. US imperialism will not tolerate even the smallest type of reforms for the benefit of the toiling masses. The local big compradors and landlords have not been overthrown and still wield extensive economic and political power in Venezuelan society. US imperialism still possesses potent tools in these local reactionary classes with which to subvert the country and impose its neoliberal capitalist policy so as to pave the way for unhampered plunder by the imperialists and local reactionaries of the country’s wealth especially Venezuela’s oil resources. Since the time of Hugo Chavez, US imperialism has not let up in its attempts to subvert the country and restore to power the most reactionary factions of the local exploiting and oppressing classes. So far, the US imperialists and local reactionaries have failed to achieve “regime change” because the people have put up resistance and the majority of the Venezuelan armed forces have rallied to the support of the people. But until these local reactionaries are overthrown through a genuine revolutionary process, US imperialism will always have an internal basis inside Venezuela to make trouble and prevent genuine social change. It is imperative for the broad masses of the Venezuelan people, especially the basic masses of workers and peasants and other toiling people to strengthen their organizations for the current struggles and prepare for even more difficult struggles ahead. Your national gathering of workers, peasants and community activists is a laudable step in the right direction for consolidating and expanding the independent power of the masses. This is an indispensable requirement for advancing the struggle of the Venezuelan people against imperialism and local reaction and for achieving national independence and genuine democracy. Down with US imperialism and local reaction! Advance the struggle for national independence and democracy! Long live La Unidad Popular Revolucionaria Antiimperialista! Long live the Venezuelan people!